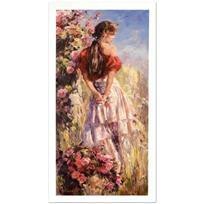 Garmash, "Morning in Provence" Hand Embellished Limited Edition on Canvas, Numbered 127/195 and Hand Signed with Certificate of Authenticity. $1,000.00 $330.00 Only 1 Left! "Morning in Provence" is a hand embellished limited edition giclee on stretched canvas, numbered 127/195 and hand signed by Garmash. Includes Certificate of Authenticity. Measures approx. 20" x 40" (image). There is minor wear to the corners that will be concealed when framed. Husband and wife team Mikhail and Inessa Garmash are considered to be two of the finest Romantic Impressionists of our day. The couple met while Mikhail was serving in the army, and he was so taken with Inessa’s beauty, that he painted her image around her hometown at night. The two were married shortly thereafter. 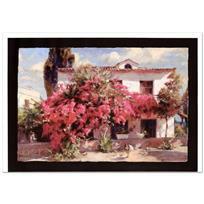 The couple did not begin painting as a team until several years into their marriage. Mikhail was working on a painting of their two-year-old daughter, Polina, and she decided to add her own creative element to the piece when her father was away. Not wanting her husband to be upset, Inessa tried to fix the painting using her own artistic training. 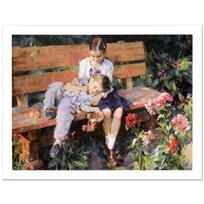 The painting was praised as Mikhail’s best work, and the two have been working together ever since. Both Mikhail and Inessa have a long history of artistic excellence. Mikhail was born in Lugansk, Ukraine in 1969, and began pursuing his artistic inclinations from the age of three. At age six, he began his formal artistic training at the Lugansk Youth Creative Center. His talent was so apparent that Mikhail’s teachers began submitting his pieces to exhibitions around the Soviet Union. Mikhail’s art immediately began winning numerous awards, including Best Poster at the 1977 Lugansk Regional Juried Exhibition. Mikhail continued his studies at the Lugansk State Fine Art College, where he graduated valedictorian, and the St. Petersburg Academy of Art. In addition to painting, Mikhail also excels at the intricate art of stained-glass window. 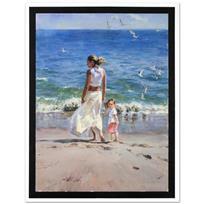 Mrs. Garmash was born Inessa Kitaichik in 1972 in Lipetsk, Russia. Like her husband, Inessa excelled in arts as a child, primarily in ballet, gymnastics, and music. After graduating from music and ballet school, Inessa entered the Lugansk Fine Art School at age 15. At age 17, she was accepted as the year’s best undergraduate to the Lugansk State Fine Art School. Her artistic career has continued to flourish ever since. "Old Town" Limited Edition Hand Embellished Giclee on Canvas (24" x 36") by Mikhail and Inessa Garmash, Numbered and Hand Signed by the Artists with Certificate of Authenticity. 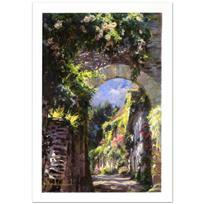 Garmash, "Morning in Provence" Hand Embellished Limited Edition on Canvas, Numbered and Hand Signed with Letter of Authenticity. "Cherished Roses" Limited Edition Hand Embellished Giclee on Canvas (24" x 48") by Mikhail and Inessa Garmash, Numbered and Hand Signed by the Artists with Certificate of Authenticity. "Garden Treasures" Limited Edition Hand Embellished Giclee on Canvas (40" x 30") by Mikhail and Inessa Garmash, Numbered and Hand Signed by the Artists with Certificate of Authenticity. 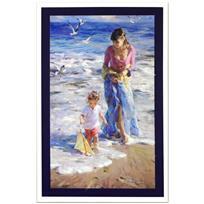 "Ocean for Two" Limited Edition Hand Embellished Giclee on Canvas (30" x 40") by Mikhail and Inessa Garmash, Numbered and Hand Signed by the Artists with Certificate of Authenticity. 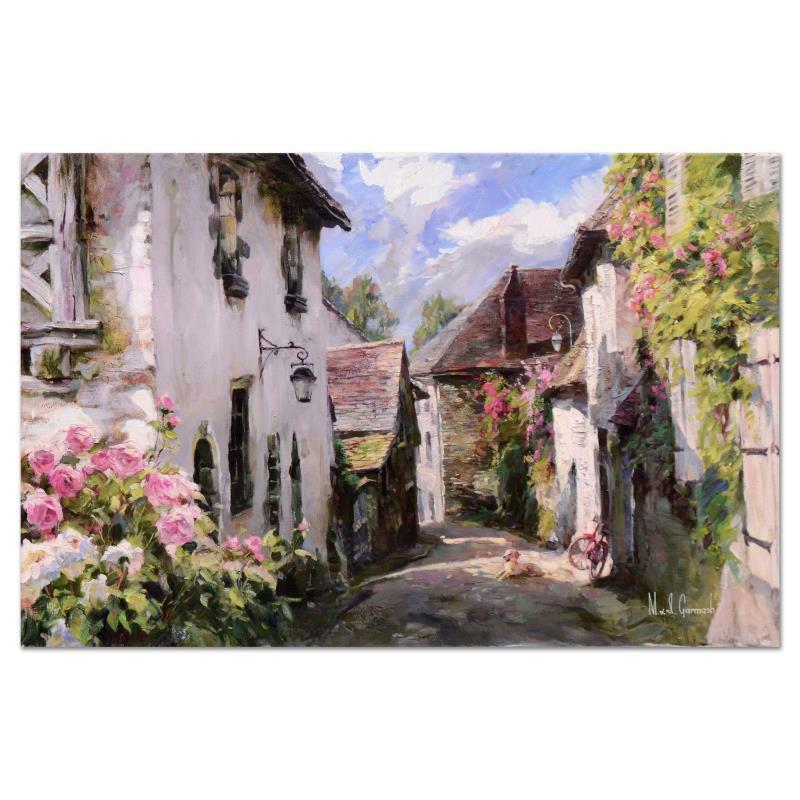 "Summer in the Country" Limited Edition Hand Embellished Giclee on Canvas by Mikhail and Inessa Garmash, Numbered and Hand Signed by the Artists with Certificate of Authenticity. "Precious Moment" Limited Edition Hand Embellished Giclee on Canvas (24" x 40") by Mikhail and Inessa Garmash, Numbered and Hand Signed by the Artists with Certificate of Authenticity. 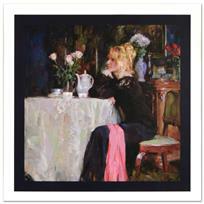 "Teatime Daydreams" Limited Edition Hand Embellished Giclee on Canvas by Mikhail and Inessa Garmash, Numbered and Hand Signed by the Artists with Certificate of Authenticity. "Afternoon on the Balcony" Limited Edition Hand Embellished Giclee on Canvas by Mikhail and Inessa Garmash, Numbered and Hand Signed by the Artists with Certificate of Authenticity. 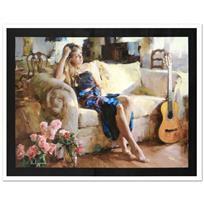 "Music in the Afternoon" Limited Edition Hand Embellished Giclee on Canvas (40" x 30") by Mikhail and Inessa Garmash, Numbered and Hand Signed by the Artists with Certificate of Authenticity.